In the midst of accusations leveled against Manny Pacquiao’s adviser Michjael Koncz by Ernie Sanchez’ manager Brico Santig and the fighter himself, that Koncz paid him much less than his contracted purse, Top Rank has debunked the claim by providing receipts showing the checks were paid directly to Sanchez. Santig claimed that when Koncz who handles Pacquiao’s MP Promotions helped Sanchez get two fights on the undercards of Pacquiao vs Timothy Bradley in June 2012 and Pacquiao vs Juan Manuel Marquez in December 2012, he received only about $1,325 for the first fight from a guaranteed purse of $6,000 and $1,450 for the second fight out of a supposed purse of $7,500. However, the payment stubs provided by the Top Rank accounting department clearly shows that while Sanchez’ purse for the first fight was $6,000 there was an “IRS withholding fee of $1,800 plus a $125 deduction for the fighter’s Nevada State Athletic Commission license fee. Top Rank presented the receipt which states that check No. 609162 dated June 8 in the amount of $4,075 was paid directly to Sanchez. For the second fight on the undercard of Pacquiao vs Marquez IV the purse of Sanchez was agreed upon at $7,500 with $2,250 deducted by the IRS as withholding fee. Top Rank’s receipt shows Sanchez was paid directly through Check No. 128219 dated December 7, 2012 in the amount of $5,250. Koncz told the Manila Standard that Sanchez used to be a fighter under MP Promotions and that Sanchez cashed his checks at the Mandalay Bay casino following earlier arrangements made even in the case of Pacquiao. 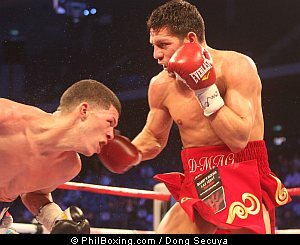 Koncz admitted that he had spoken briefly to Top Rank promoter Bob Arum about the “mismatch” putting Sanchez whom he described as “a tough kid who may not get knocked out” by the world rated Diego Magdaleno but could suffer serious injuries similar to what happened to Z “The Dream” Gorres who won his ten round bout but collapsed in the ring after the decision was announced and underwent emergency brain surgery and had to quit boxing. The 22 year old Sanchez is not even rated as of the December ratings of the Games and Amusements Board and has a record of 14-5 with 5 knockouts which includes his two eight round unanimous decision wins over Wilton Hilario and Coy Evans on the Pacquiao undercards. Sanchez is a super bantamweight where the limit is 122 pounds while Magdaleno is a super featherweight with a weight limit of 130 pounds. He has a record of 24-1 with 9 knockouts and lost by a split decision in a WBO super featherweight title fight against Roman “Rocky” Martinez on April 6, 2013. Sanchez on the other hand lost his last two fights in Mexico in lopsided decisions against superior fighters. On November 2, 2013 he lost to undefeated Andres Gutierrez (27-0-1, 22 KO’s) in a WBC Silver super bantamweight title fight which Gutierrez dominated and then lost badly in a ten round clash for the WBC Youth Silver super bantamweight title to another unbeaten Mexican Rey Vargas who had a record of 15 knockouts in 17 wins on December 21 although Sanchez was commended for his toughness and ability to take some big shots. Sanchez lost by a 100-90 shutout on the cards of two judges and 99-91 on the third judges scorecard which underscored the fact that both fights were mismatches approved by the Games and Amusements Board boxing division which had also approved the Sanchez-Magdaleno fight. Top Rank took Sanchez off the Saturday card and replaced him with Jorge Pazos (14-6-1, 8 KO’s). Photo: Diego Magdaleno (R) in action against Roman Martinez in Macau in April last year. Photo by Dong Secuya.